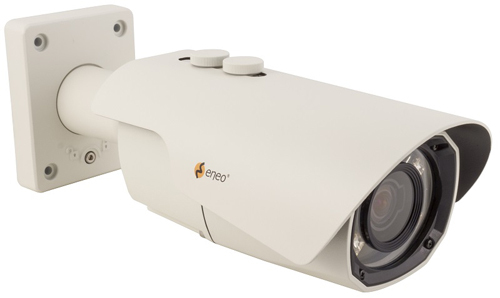 The next generation of eneo IP cameras includes five Candid bullet cameras, four Callisto domes and two Candid box cameras to suit a range of indoor and outdoor applications. The premium eneo IP cameras come with a choice of 2MP (1920 x 1080p) progressive scan CMOS and 3MP (2048 x 1536p) or 5MP (2592 x 1944p) Sony STARVIS sensors. Each camera is triple streaming (2x H.264, 1x MJPEG) and includes MP lenses to optimise image quality. Martin Morris, eneo Business Development Manager UK & Ireland, explained, “All eneo’s new IP bullet, dome and box cameras come with a new, cross-web browser interface, with responsive web navigation. It is compatible with operating systems and web browsers including IE, Safari, Firefox and Chrome. The new interface not only enables secure, quick and simple camera set up, but also adapts responsively to PC and mobile device viewing. Push focus and push auto focus, macro commands are also included. eneo Candid bullet cameras come in five models. Motorised, varifocal lens models include a compact 2MP and a standard sized 3MP camera, both with a 2.8 to 12mm lens. The 5MP, motorised model comes with a 3.6 to 10mm lens. There are two, auto focus zoom (AFZ) lens models, both with 2MP sensors, a 3x optical, 3.0 to 9.0mm option and a 10x optical, 5.1 to 51mm option, both with smart IR and true WDR. eneo Candid box cameras include a 5MP option with C/CS lens mount and a 2MP, 3x optical, AFZ model with 3.0 to 9.0mm lens.